BULLDOGS: The two-time champs led by John Rokos and a supporting cast with Roger Marks and newcomer Frank Szilagy. This team faces an uphill battle to threepeat with some serious competition this time out. BLACKOUT: This Baltimore area squad, led by Jay and Matt Diese and C.J. Alesso, is highly skilled and comes in as the favorites. They are scary good! SHETAUG HOCKEY CLUB: Jeff Bales leads up this talented cast of characters including Jason Jaworski, Danny Voronkov, and newcomer Toby Huesser. A trip to the championship game is a real possibility. 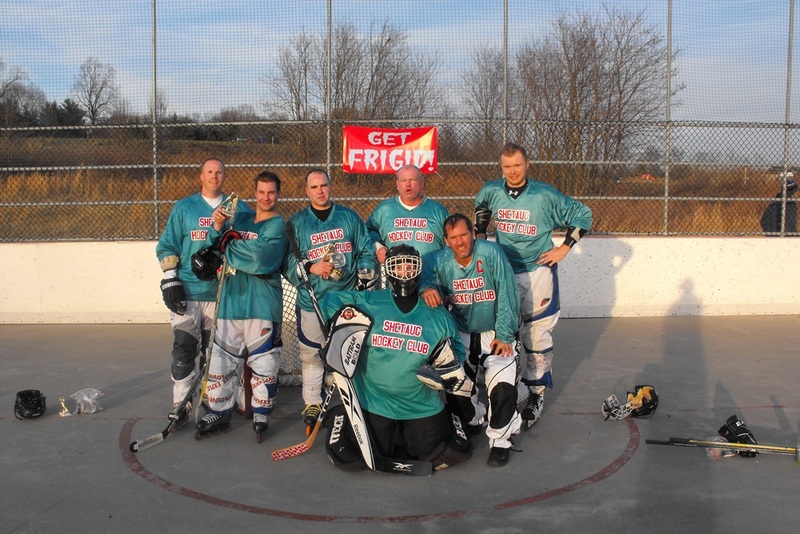 STONE CUTTERS: Sep Fraunhoffer leads this team, a dedicated ice hockey squad from Laurel, into the tournament. Expect their teamwork and experience to carry them far. IMPACT: Rick Hoskins heads up this group of hard-working players that will be trouble for their opponents. They will advance to the playoffs - but can they defeat a more-talented team to make a run? JESTERS: This roller team from the Laurel league, featuring Drake Deming, Ryan Peterson, Bryan Bednarczyk, and Matt Jenkins, has the talent to threaten. Goaltender Eddie Owen must carry the day though. WEST VIRGINA WARRIORS: Goaltender Brian Bowers brings this newcomer squad over from Martinsburg. They are a complete mystery you can expect them to hold their own. WIND WALKERS: This Joe DiGrazio-led group is shifty and will score some goals, but can they stop anyone on defense? BOOZE BROTHERS: This squad is led by Frigid veterans Mike Dobbins and Steve Ricketson. They lack high-end talent, but hard work and smart play could be a positive factor. WILD WOOKIES: Pat Otterson and Kris Edmondson head up this crazy cast of characters. They will struggle to keep up with the much more skilled teams in this field. The action commenced at 7:45am with expected wins by the SHETAUG HC and BLACKOUT, defeating the WILD WOOKIES and the WIND WALKERS respectively. Game #3 of the day pitted a seemingly even STONE CUTTERS-JESTERS matchup. Goaltending ruled the contest and it ended in a scoreless tie. The CUTTERS managed to pull out the OT shootout win. The next contest was a major surprise and featured the BOOZE BROTHERS upsetting the defending champion BULLDOGS 3-2 in an OT shootout. This was the start of a very disappointing day for the BULLDOGS. Wins by the IMPACT and BLACKOUT followed. Game #7 featured the WARRIORS, new to the tournament, challenging the JESTERS. This tight contest ended in a 1-0 WARRIORS victory. The next game saw the Stonecutters-Booze Brothers end in another scoreless tie, with the Cutters winning their second straight OT shootout game. Two games in and the JESTERS and STONE CUTTERS had each failed to tally a single goal in regulation. How would this play out?? The following two games saw SHETAUG defeat IMPACT 2-0, and the WIND WALKERS take down the WILD WOOKIES 2-0. Game #11 and #12 featured key matchups between the BULLDOGS-JESTERS and WARRIORS-STONE CUTTERS. The misery of the JESTERS continued as the wily BULLDOGS prevailed 3-1, while the STONE CUTTERS improved to 3-0 with a 2-1 victory over the boys from West Virginia. The next two games saw the BLACKOUT and SHETAUG rack up convincingly wins to improve to 3-0 each. The next contest pitted the STONE CUTTERS against the BULLDOGS, with the CUTTERS winning a close one 2-1. The next two games saw the BOOZE BROTHERS defeat the WARRIORS 3-1 and the IMPACT shutout the WILD WOOKIES 5-0. Game #18 was the premier matchup of the morning with undefeated heavyweights BLACKOUT and SHETAUG squaring off. The matchup failed to live up to the hype as the BLACKOUT pulled away to win 4-0. The JESTERS then defeated the BOOZE BROTHERS 2-1 in an OT shootout to gain some much-needed points in the standings. Next up was the WARRIORS-BULLDOGS matchup with both teams sporting a disappointing 1-2 record. The WARRIORS showed their spirit and crafted 2-0 victory, putting the now 1-3 BULLDOGS in serious jeopardy of missing the playoffs. The last round of the prelims (five total games) would settle the last remaining spots. The STONE CUTTERS started things off by defeating the IMPACT 3-0, while the SHETAUGERS defeated the JESTERS 3-2. The BLACKOUT edged the Bulldogs 1-0 to tough game, while the WARRIORS and WILD WOOKIES won close games top to bring the prelims to an end. The top six teams qualified for the playoffs and it looked like this: #1 BLACKOUT #2 STONE CUTTERS #3 SHETAUG HC #4 WV WARRIORS #5 BOOZE BROTHERS #6 IMPACT. The biggest surprises featured the BULLDOGS finishing as the #7 seed, just missing the final playoff spot, and the BOOZE BROTHERS playing well to steal the #5 seed. 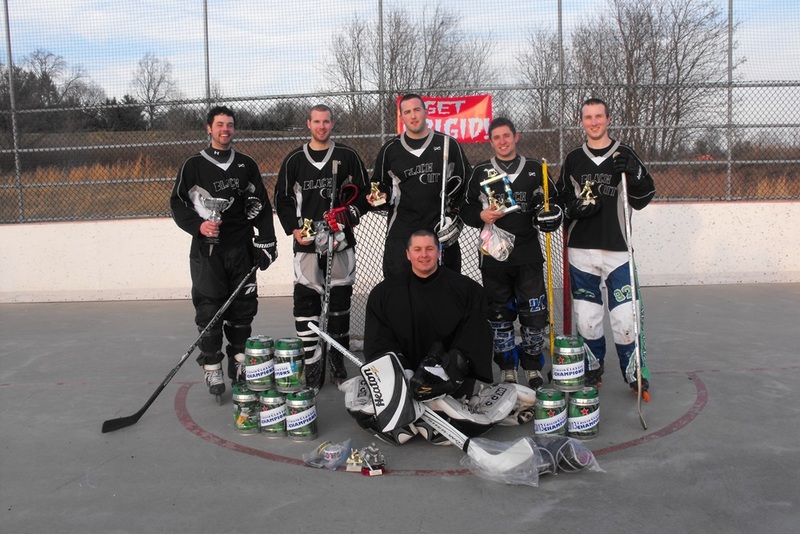 In the first playoff game #4 WV WARRIORS handled the surprising #5 BOOZE BROTHERS by the score of 2-0. The #3 SHETAUG HC followed this up with a tight 4-3 victory over the #6 IMPACT. Next up the #1 BLACKOUT shutout the #4 WV WARRIORS 3-0, while the #3 SHETAUG HC took down the #2 STONE CUTTERS 2-0. The championship game featured the much-expected rematch of the #1 BLACKOUT against the #3 SHETAUG HC. Two goals by C. J. Alessio paced the BLACKOUT boys as they pulled away in the second half to win 3-0. Congrats to the BLACKOUT - the Frigid Classic 3 Champions! Top goalie honors went to BLACKOUT netminder Dave McDonnell, while BLACKOUT forward C. J. Alessio took home the "Top Dog Award" as the tournament MVP. An honorable mention must go to the WILD WOOKIES goaltender Jason Blessing for a superhuman effort throughout the day. C. J. Alessio also took home the high scorer award with a 9g-4a-13pts performance. Other notables were the SHETAUG's Jason Jaworski with 7g-5a-12pts and the BULLDOGS' Mike Staub and the SHETAUG's Toby Huesser with 6g each. The top helper man was the BLACKOUT's Jay Diese with 7a.